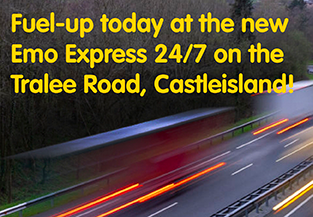 The latest addition to our expanding network is now open on the Tralee Road in Castleisland. Our latest site is a great new option for diesel-vehicle drivers. And we accept Emo fuel cards too – so if you haven’t already signed up for one, now’s a great time to do it! Stopping and filling is easy with Emo Express! 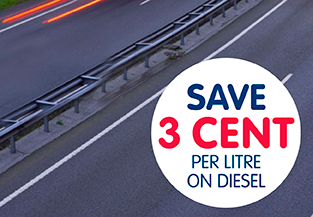 Fill up on Diesel, MGO or AdBlue all day, every day, all year round. Pay at the pump and get back on the road – pronto! Credit, debit and Emo and DCI fuel cards are accepted. To celebrate the opening of our newest site, we’d love to offer drivers a 3 cent discount per litre with the barcode on the attached form. Just print out the page, scan it at the pump and follow the onscreen instructions to claim the discount. Please don’t try to use this barcode on your phone or device – use of phones at all of our sites is prohibited in the interest of health and safety. Print your Barcode from here!